From Right to Left: Sam Fleming, Web Johnston, Walter Diehl, Sam Hunt, Charlie Kane. As a purpose-driven organization, SunTrust Bank is dedicated to Lighting the Way to Financial Well-Being. That commitment is evident through its dedicated teammates, making SunTrust uniquely positioned to have a significant impact on the people and communities it serves. SunTrust recently took steps to build upon its purpose by sparking and leading a movement, onUp, designed to be a catalyst in inspiring people to make personal commitments to improve their financial health. SunTrust employees understand that success is defined by the impact their bank has on the lives of their clients, their communities, and their teammates. A hallmark of SunTrust’s success and a key element in its future is its local market orientation. Experience has shown that no one knows the unique needs of each community better than those who live and work there. Delivery of “big bank” products and services at the local level is the way the SunTrust model works. Conceptual rendering of Nashville’s new SunTrust Plaza. 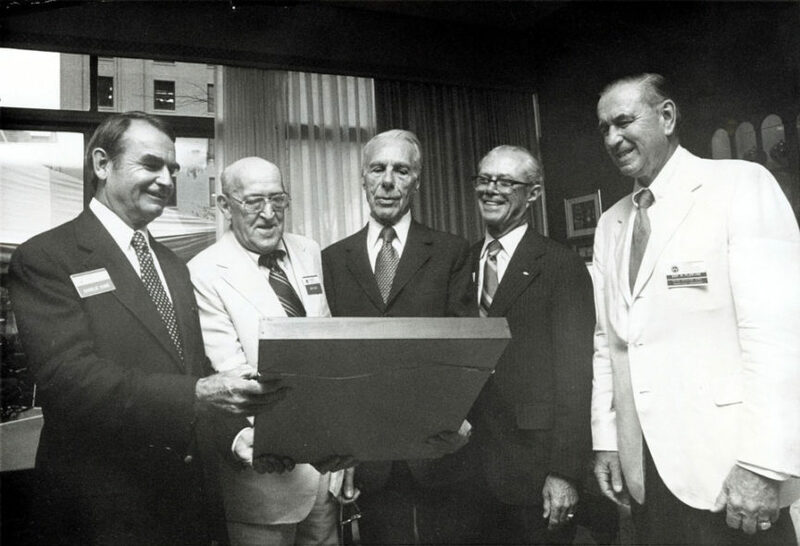 The growth of SunTrust Bank–Nashville, part of SunTrust Banks, Inc., began in 1927 when a trio of entrepreneurs, Frank Farris, Walter Diehl, and Charles Sykes, set out to prove that Nashville needed another bank. What began as a bank with just $720,000 in assets has grown in nearly 90 years to become one of Nashville’s largest commercial banking institutions based on deposits. Nashville today is a primary growth market within the SunTrust brand. And the bank is uniquely capable of serving the more than 1.8 million people and 40,000 businesses in the area with a wide range of consumer, commercial, corporate, and institutional clients with deposit, credit, trust, and investment services. 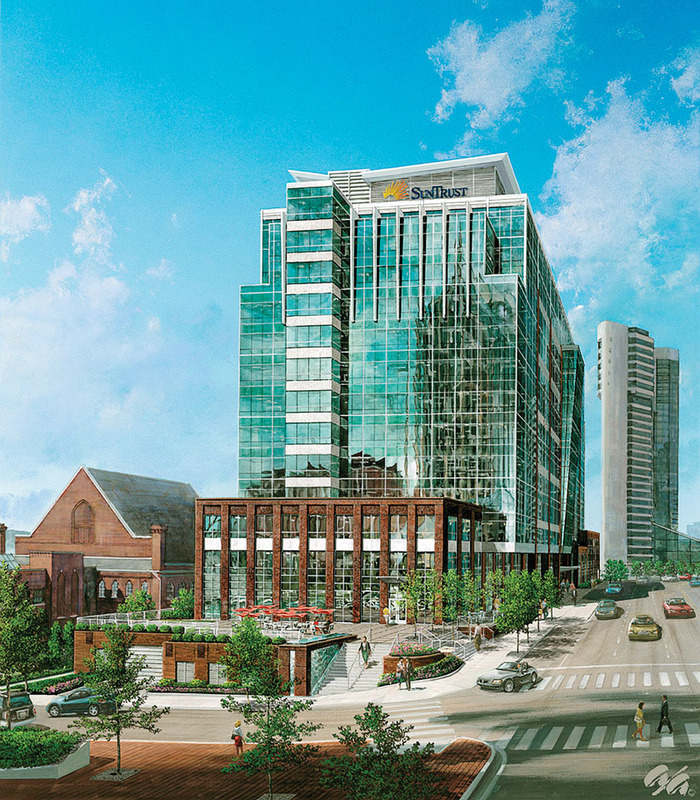 SunTrust Nashville’s headquarters are located on Nashville’s Commerce Street next to the historic Ryman Auditorium. With SunTrust’s deep roots in the music industry, it is fitting for the bank’s Nashville home to be located next to the “Mother Church” of country music. It is also fitting that the late Brian Williams, one of SunTrust Nashville’s senior vice presidents, was the person credited with bridging the gap between traditional banking and the unconventional ways of the music industry to create a niche for Nashville’s banking industry. Bank Director magazine in 2003 credited Williams and SunTrust with pioneering the practice of lending money against future royalty income, making the songs themselves the collateral. SunTrust Nashville’s President and CEO, Robert E. McNeilly III, is charged with supporting the company’s overall initiatives by identifying opportunities and achieving lending, investment, and service goals to ensure that the company is making the right moves in the right places. In addition, SunTrust’s employees are giving of their time and money to continually strengthen the Nashville community. Contributions are made to United Way, and employees serve as volunteers building houses with Nashville Area Habitat for Humanity and working with social service providers, schools, and other groups in the area making Nashville a better place to live, work, and play.